As an encyclopedia building project, Wikipedia seeks to create a summary of all human knowledge: all of topics covered by a conventional print encyclopedia plus any other “notable” (therefore verifiable by published sources) topics, which are permitted by unlimited disk space. The hijab tax is a proposal for a new tax of the Dutch politician Geert Wilders. The hijab is, according to Geert Wilders, a contamination of landscape and anti-woman. That’s why he proposes a tax of 1000 euro’s a year for wearing a hijab. The hijab tax seems to be political framing, and not serious at all. (My guess is that Wilders aimed to get people talking about the word “kopvoddentax”, which is a humiliating term.) On the other hand, I couldn’t answer the question ‘why should it be excluded from the summary of all human knowledge?’ For that reason I decided to create a Kopvoddentax entry in Dutch and a Hijab Tax-entry in de English version of Wikipedia. We don’t like the word, and it should never be included in the Dutch language. It’s not big enough, it should be added to the Partij van de Vrijheid entry, or we even should create a new entry: “Rijksbegroting 2010”. Because Geert Wilders is wrong. Although I agree with the first point, I would say this is a political reason. On the other hand, why should we accept this kind of framing? So it might be better the rename the entry to “hoofddoek-belasting” (hijab-tax). The second and third reason seem absolutely old fashion to me. Why should the summary of ‘all human knowledge’ wait until an institution decide whether a word is used enough to add it to its official language. I think the third reason, even more than the second, reveals the old logic of an encyclopedia. 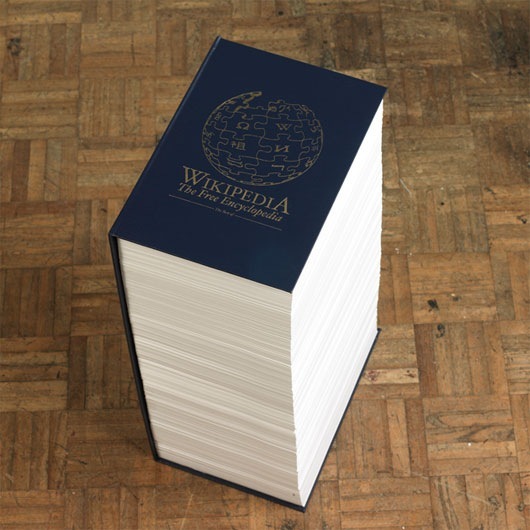 Although Wikipedia uses some potential of the internet extensively, it is still based on the foundations of an encyclopedia. Although its structure is loudly applauded[i], many agree that some of its functions doesn’t work properly[ii]. For example the categorization is a total mess. Partly because of semantics, but for a large extend due to Wikipedia’s much bigger size. Another example of the encyclopedic style is the language. Wikipedia’s language has to be ‘encyclopedic’ and cover ‘encyclopedic’ questions. The question is, is an encyclopedia (still) the best way to summarize human knowledge? Maybe it is even better to ask, what is the purpose of a summarization of human knowledge? How can Wikipedia benefit by getting rid of its encyclopedic roots? Ps. The illustration is the Wikipedia book made by Rob Matthews. [ii] For example in Weinberg, D. Everything is Miscellaneous, 2007 the categorization is questioned. « Wikipedia assignment: Is ‘WikiTrust’ the next step towards a more reliable online-encyclopaedia?